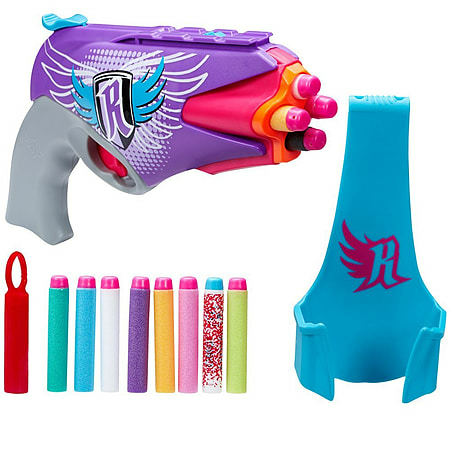 Nerf Rebelle Quantro Victory Blaster. Show your spy style and take your shot for the win with the Nerf 4Victory Blaster! 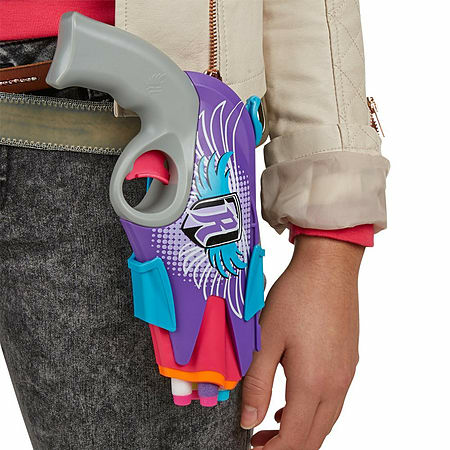 It's easy to load this stylish blaster with 4 darts, then keep it close for quick-draw action in the holster. When it's time to draw, you can fire all 4 darts at your target without reloading! Whether you're sending a secret message on the included Message Dart or making your mark with the collectible darts, you can hit targets up to 75 feet away. Blast fast with the 4Victory blaster! Includes blaster, 4 darts, holster, decoder, and instructions. Includes 1 Message Dart and 3 collectible darts. 4Victory blaster fires 4 darts in a row with no reloading. Fires darts up to 75 feet. Decoder reveals secret messages. For ages 8 years and over. . WARNING(S): Not suitable for children under 3 years old.